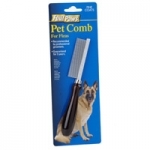 Conair Yellow Dog Flea Comb with Memory Gel Grip easily and gently removes fleas from your pet's coat. 1/2-inch tightly spaced stainless steel teeth are angled for precise positioning and effective use. 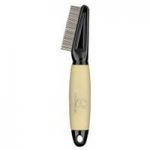 The gel grip handle offers maximum control and comfort with its soft, non-slip grip. Feel it and see for yourself how comfortable it is!